You may remember back in June I discussed how I've been trying out the Walmart Family Mobile plan. I was excited to try a new cheap wireless plan that was affordable AND had unlimited data. I've been on a plan that shares data between my hubby and I - and we are on our phones a LOT and use a LOT of data! Overage fees can be CRAZY expensive and it's just not a fun situation to be in!! I've JUST recently joined in the Zumba craze!! I've heard great things about it - my sister (seen below) started working out a few years ago doing Zumba and lost a lot of weight. She enjoyed it so much she became an instructor and now teaches weekly! But, my sister lives an hour and a half away from me - so I can't go to her classes every week. So, I started going to some local classes! I had been paying $7 a class to attend one Zumba class every week - which was $28 every month. Since I've been saving with my cheap wireless plan with NO contract, I decided to dive in and join a gym! Now I pay $35 every month that allows me to go to a class five days a week....if I was really dedicated :) I go to about 2-3 classes every week and have really enjoyed shaking my booty and sweating a lot!!! Seriously, one hour of Zumba goes by SO much faster than 40 minutes on the treadmill. I love it! If I hadn't been able to save some cash by using the Walmart Family Mobile plan I don't think I would have been willing to commit to a gym membership. What's something new that YOU would try if you had a little extra cash to spare?? 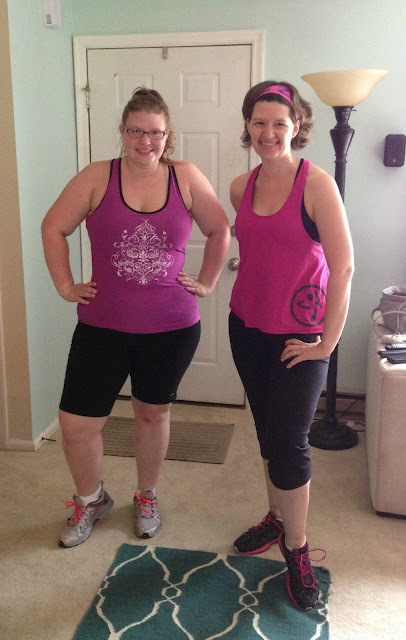 I've heard great things about Zumba and certainly a great sign that your sister became an instructor! The simple truth is that a budget can only stretch so far and cutting back on your regular expenses and finding ways to save is a great way to afford new things you want to try or purchase! Thanks so much for sharing your experience!